My Labrador Kelsey has been taking this product for about 20 months since she has had cancer. She has way outlived her life expectancy with cancer and I believe its from the help of this mushroom and other herbs. I bought Coriolus Versicolor-MRL 500 mg by Mycology Research Laboratories for my allergies and ear aches, I take 2 every morning and 2 every evening. It really helps a lot. I did a lot of research online about this mushroom. It really helps. 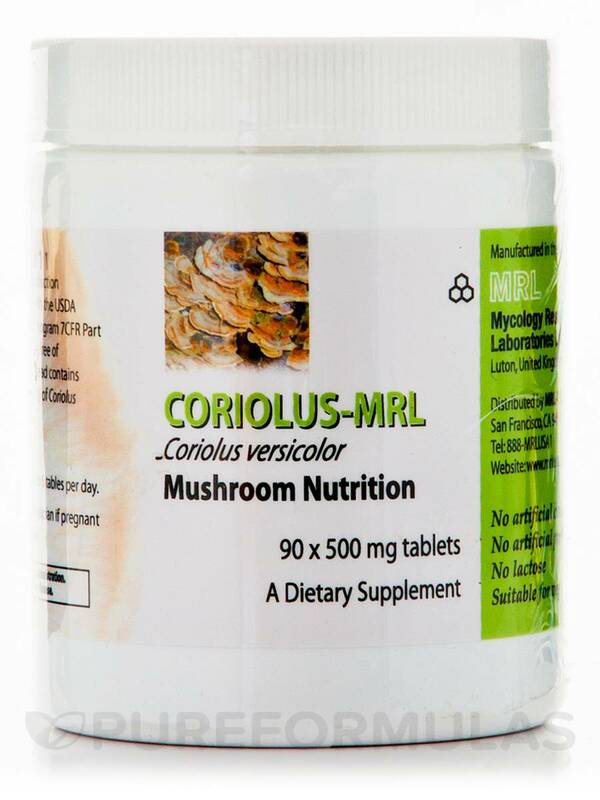 This Coriolus Versicolor-MRL 500 mg by Mycology Research Laboratories definitely comes at a good price (relative to elsewhere). Easy and fast shipping. You can tell that Pure Formulas cares to distinguish themselves in terms of customer service. Coriolus-MRL is not an extract‚ but instead contains both the mycelium and primordia (young fruit-bodies) of Coriolus versicolor grown aseptically into a biomass. The biomass is then manufactured into 500 mg tablets in Holland by Biosana. 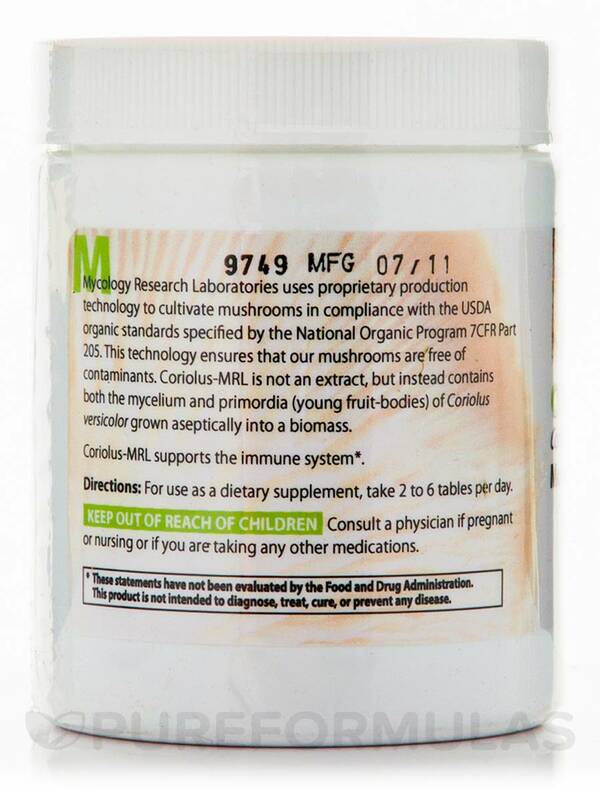 Coriolus-MRL supports the immune system. Microcrystalline cellulose‚ vegetable stearic acid‚ silica‚ and vegetable magnesium stearate. For use as a dietary supplement‚ take tow to six tablets per day. 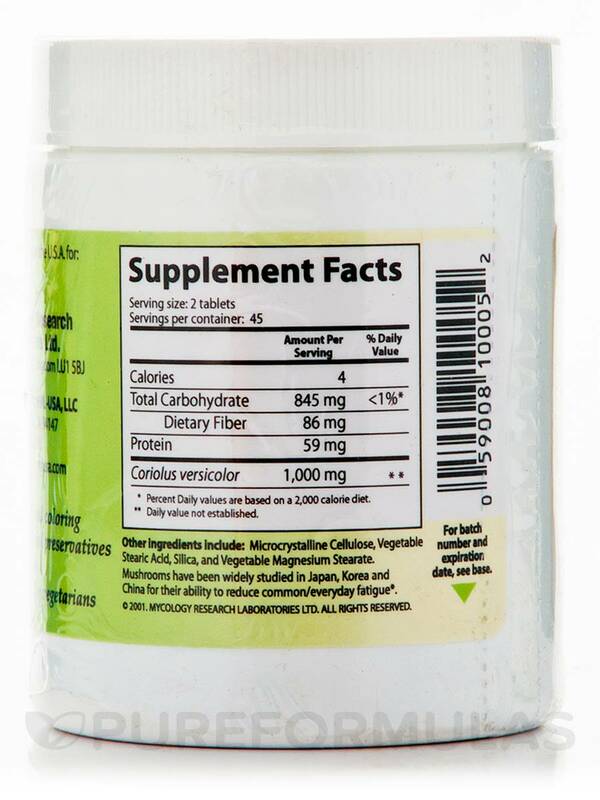 Very good supplement & great price! Coriolus Versicolor-MRL (common name Turkey Tail mushroom) is a great cancer-fighting supplement. (was recommended to me by other dog owners fighting canine cancer - research studies very promising!) This, in addition to other supplements, has extended the life of my precious dog Elvis, a rat terrier who was diagnosed with Hemangiosarcoma end of Feb 2014. His prognosis was 1-3 mos. Well here we are, more than 7 months later and he is still doing very well!!! Cancer- fighting, easy to feed (to my dog) - great price & PureFormulas always delivers very promptly!!! 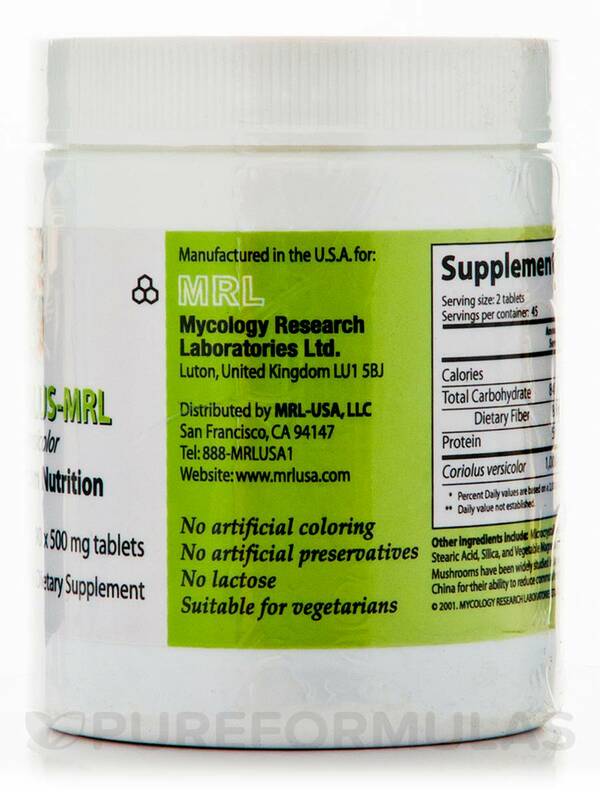 I use Coriolus Versicolor-MRL as part of a diet and supplement regimen for my dog who has cancer. Being able to get this quality product at a great price is appreciated. The MFG date is 07/11, which means the product displayed on your website was produced in 2011. Is this why your price is cheaper than the other sellers? If the photo does not represent the products you are currently selling, please let me know when they were produced. Akemi, the image you see is to display the product. That date shown is not accurate. The MFG date that we have on the shelves at this time is 02/15.